It must be fun to be Henry Dirkmaat, owner and founder of Henry's Gelato. 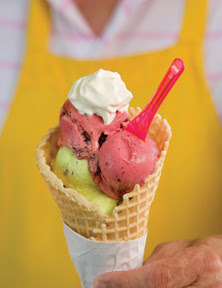 Imagine constantly dreaming up new flavors of gelato, the delicious Italian variant to ice cream. With more than 80 flavors in the store's overall repertoire, it’s safe to say customers have plenty of choices. Small batches of gelato are produced on-site daily by Henry or other specially trained artisans. Approximately two dozen flavors are showcased in display freezers at any given time, and these are rotated regularly to maintain diversity. Sophisticated and unfussy concoctions are presented with equal aplomb. Consider rich Belgian chocolate, caramel apple, baklava and bubble gum. Then there are selections like cozy interlude (an amazing concoction featuring dark roast coffee with chocolate and hazelnuts),peach champagne and orange dream. Popular sorbets include blood orange, fruits of the forest, lemon and grapefruit. The store also sells gelato-based cakes and pies. There's even pet-friendly K-9 Crunch available. During the summer months, the three area Henry’s Gelato stores are open seven days a week.